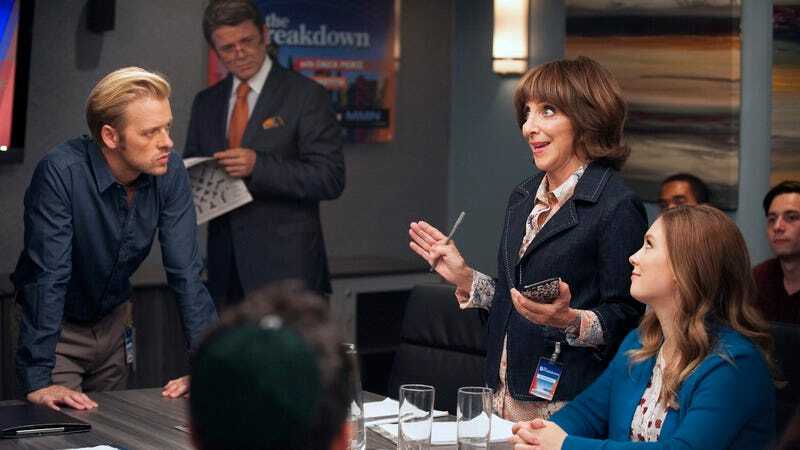 The Breakdown With Chuck Pierce will live to break down again: NBC has renewed its freshman sitcom Great News, about a dogged cable-news producer Katie Wendelson (Briga Heelan) working alongside her overprotective mother, Carol (Andrea Martin). As Deadline notes, the sitcom isn’t performing as strongly in the ratings as its predecessor in the post-The Voice timeslot—the equally worth-your-time true-crime sendup Trial And Error—but it is a product of NBC’s corporate cousin, Universal TV, one that’s produced by the 30 Rock and Unbreakable Kimmy Schmidt team of Tina Fey and Robert Carlock. So, just like Great News’ lead characters, NBC is keeping it in the family, while adding to an increasingly winning stable of single-camera series that includes The Good Place, Superstore, and promising newcomer AP Bio.